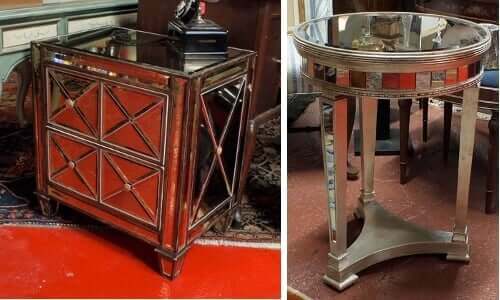 Mirrored Furniture DIY – We love the art deco feel of trunks and vanity tables with mirrored surfaces, but cringe at the price tag of these reflective furniture pieces. So we were happy to find a lot of tutorials on Pinterest on how to mirror furniture yourself. can be a little difficult and definitely will take longer than an hour for the finished product, but you can save hundreds of dollars by doing it yourself, especially if you’re using old furniture that you bought from a yard sale. First up, you will want a piece of furniture to mirror. A piece with large, flat vertical surfaces will work, such as a nightstand, a vanity, or a set of drawers. You don’t have to add mirrors all over the entire piece – adding a reflective surface to the most prominent sections of the piece will be easiest and still look impressive. Remove knobs and sand the furniture you want to mirror. Apply 3-4 coats of spray paint on the piece, or as many coats necessary to cover the piece. For the surfaces you plan on mirroring, use coarse sandpaper and lightly sand these areas. Measure and cut your mirrors to your desired size with the glass cutter. If you haven’t used a mirror cutter, it’s probably best to buy more mirrors than what you think you will need in case you break a piece. After you’ve cut your mirror pieces, sand the edges with very fine sandpaper. Apply liquid nails to the back of your mirror pieces and press into the area you want mirrored within 10 minutes of application. Be sure to follow the directions on the liquid nails tube for the drying time. If using molding: spray paint your molding. Then apply liquid nails to the back of the molding and place it around any mirrors on your furniture.